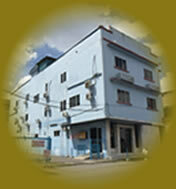 Abell Residence is located in the heart of the city center. It is only 8 kilometers or 16 minutes from Kuching International Airport. It is in close proximity to entertainment and eating outlets as well as shopping malls, banks and offices. 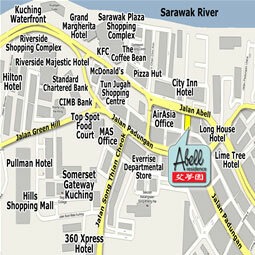 Abell Residence is within minutes of walking distance to the famous Kuching Waterfront. It is also less than 5-10 minutes walk to the famous Chinese history temple, Tua Pek Kong, Main Bazaar and Chinatown. Malaysia, August 2012 - a great place for travellers who like hassle-free & no-fuss accommodation. it's no five-star, but price & facility is exactly corresponding to what one would get. Afghanistan, Feb 2012 - First of all, location! In walking distance to everywhere, long-distance buses (red ones, which can take u to anywhere in Sarawak, Sabah and to Pontianak in Indonesia) just next to the hotel, best money exchange (called Everrise, run by local Chinese,best rates I saw in Kuching) just around the corner, and the last one, bus to Bako (red one) just across the street! And remember to try breakast in the place on the left! Rooms speciouse, clean, just no lift. Overall, nice place! 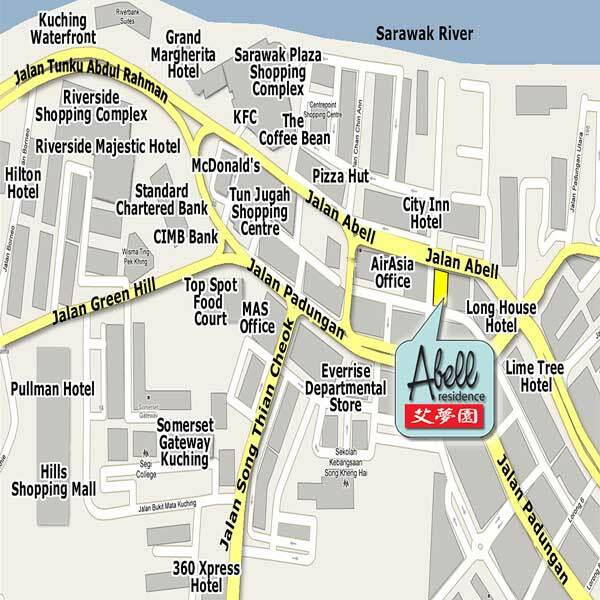 Malaysia, Jan 2012 - Abell Residence is located at the city center of Kuching and it takes only 10 minutes walk to the Kuching Waterfront where the main bazaar is located. Convenient stores and coffee shops were easily accessible and thus, there is no problem in finding good food to eat as this hotel does not provide any food or dining. The hotel staffs were friendly and they even assisted me in finding directions to the hotspots in Kuching. The hotel has a private car park area and thus, it is very convenient for us as we do not need to search for car parks and pay the parking fees. The room that we stayed in looks new and was spacious, clean, quiet and comfortable. We love the queen size bed provided as it was huge and comfortable. In addition, the room was equipped with a cupboard, table and 2 chairs, hot shower, good Wi-Fi service, TV, fan and air conditioner. The corridor of all the rooms in all the floors was guarded by CCTV and thus, we felt the security was good and we felt safe to leave our belongings in the room. All of these make us felt happy and satisfied with our 3 night stay in this hotel as it is value for money. Malaysia, Nov 2011 - Nice location. Walking distance to shopping complex, waterfront and also to many food eateries around. Singapore, Oct 2011 - Reasonable price with standard facility. Singapore, Aug 2011 - Very near to Chuen Choon coffeeshop where one of the best Sarawak laksa stall is located. Within its vicinity is the bus stop where you can take bus to Bako National Park. KL, Malaysia, Jul 2011 - Just come back from kuching, the staff are very friendly n helpful.. The location is good..near with RJ ayam Bakar restaurant,mcd,sarawak plaza,cat statue and also waterfront..very affordable price for us as group traveller. Malaysia, Jul 2011 - Excellent value for money! You get your own room, air-conditioning, TV,basic toiletries. It\'s not seedy at all and the beds are generously-sized. Staff are lovely; I arrived much earlier than the check-in time, and they let me rest in another room till mine was ready... when I said I\'d had enough rest and wanted to go exploring (but my room wasn\'t ready yet), they took my bags and kept them for me behind the counter, and when I got back late at night, they had put my luggage into my room for me! Australia, Jul 2011 - Nice staff, big clean room with TV and air con. USA, Jul 2011 - We enjoyed our stay and would recommend Abell Residence to other travelers looking for a great deal and perfectly adequate lodgings. It was an easy walk into downtown Kuching. The staff was very helpful and let us do a really late checkout as we took a cooking class in Kuching. Nurul - Malaysia, May 2011 - The staff is really friendly , then the location is near to the shopping complex such as Tun Jugah or sarawak Plaza also the cat statue..easy to park the car. Malaysia, Apr 2011 - The cleanliness is quite good. Staffs are friendly and helpful.